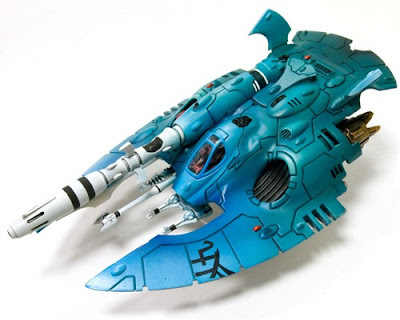 The Warp Hunter, perhaps the rarest of Eldar tanks, sacrifices the transport capacity of the Falcon chassis to mount the terrifying firepower of a large D-Cannon, a weapon capable of tearing open the very fabric of reality and engulfing its target in the dark energies of the Warp. Complete resin and plastic kit. Model designed by Stuart Williamson. Rules for the Warp Hunter can be found here. Disguised behind shimmering holo-fields, draped with gossamer-thin robes and wraith-like in appearance, the Shadow Spectres were believed long lost by Eldar Seers. Armed with prism rifles, each a potent anti-tank weapon, and equipped with jet packs, their mobility allows them to hunt down their chosen targets with the implacable patience of the dead, materialising seemingly from the very air to unleash their overwhelming firepower. This kit contains 5 full resin Aspect Warriors including scenic bases. Models designed by Simon Egan. Please note that the wire stand shown in two images is not included in this kit. Some careful conversion work will be required to acheive this effect. 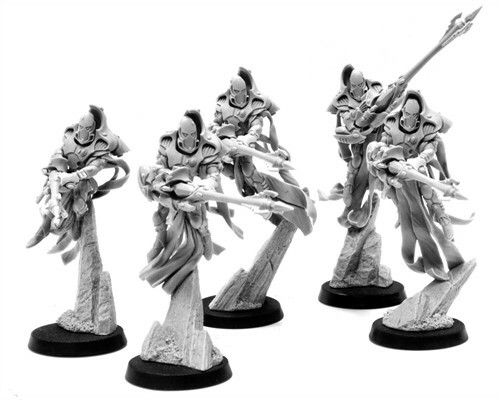 Experimental rules for the Shadow Spectres aspect are available to download here.